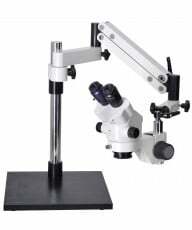 A magnifying lamp is an essential tool for anyone working with precision assembly, inspection or design. 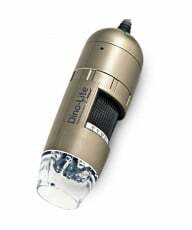 Because users can effortlessly view smaller details, lighted magnifying lamps are tremendously helpful in reducing eye strain and preventing vision fatigue. As a result, they are popular with jewelers, watch and electronics repair, dental clinics, industrial inspection, scientific research laboratories and the home office. This quick reference guide will boost your understanding and guide you to the magnifier which best suits your needs. Do I need a "lighted" magnifier? 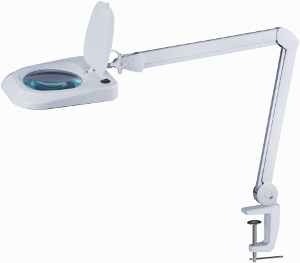 Good, clean lighting is an essential element to consider when choosing a magnifier. Many workplace locations have indirect and shadow-filled lighting conditions at best, resulting in marginal viewing performance. 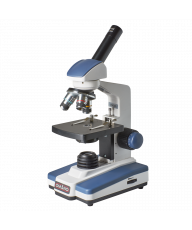 Lighted magnifiers compensate for this with a quality fluorescent, halogen or LED lighting element embedded around the viewing glass frame. Fluorescent lighting brings out clarity of view by shining a broad, cool and shadowless light. 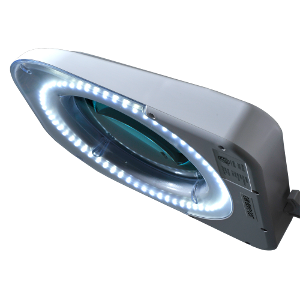 Halogen lamps will yield a warmer glow and heat up more quickly. LED lamps put out less lighting, yet tend to last much longer than either fluorescent or halogen bulbs. What does 'Diopter' mean? 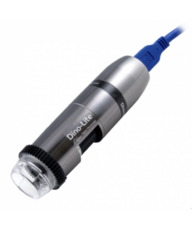 When looking at various magnifiers, you'll come across the term 'diopter'. This refers to the amount of curvature a lens will have. More curvature means a thicker lens, more magnification and a higher diopter number. To find the magnification level of a lens, simply divide its diopter by 4, and add 1. For example, if you're looking at a 3-diopter lens, it's magnification = ¾ + 1... or .75 + 1 = 1.75x. Objects viewed under a 3 diopter lens will appear 175% bigger than normal. A 5-diopter lens = 5/4 + 1... or 1.25 + 1 = 2.25x. Objects viewed under a 5 diopter lens will appear 225% bigger than normal. What does focal length mean? Focal length is defined as the distance from the lens to the point where an object is in focus (focal point) and it becomes important if you need space above the object in which to work. It's kind of like shining a flashlight on a dark wall. As you move the flashlight (magnifier) closer to the wall, you are reducing its distance (focal length). As you move the flashlight back from the wall, the distance (focal length) increases. Unfortunately, you can't have lots of magnification and lots of room below the lens (focal length). If you need lots of space to work, you won't have as much magnification available. 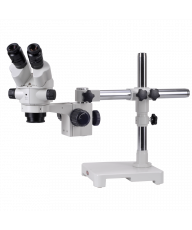 If you don't need much working space, you can get stronger magnification, and in fact, magnifiers with higher power are generally reserved for close-in inspection and measurement... 3 diopter = 1.75x magnification at 13” focal length 5 diopter = 2.25x magnification at 8” focal length 7 diopter = 2.75x magnification at 5.5” focal length As a general rule of thumb, when your magnification gets larger, your lens and focal length get smaller. What is meant by 'Field-Of-View' (FOV)? The field of view is the size of the magnified area that is in focus under the lens. The higher your magnification, the smaller your field-of-view. Lets go back to our flashlight example. As you move the flashlight closer to the wall (stronger magnification), the spot of light (field-of-view) will shrink. Do I need "HANDS-FREE" viewing? One of the main benefits of a magnifying glass is the ability to use both hands to work with the object while under magnification. When repairing electronics or other close-in work, hands-free operation is absolutely essential. What does it mean to be ESD-Safe? Electrostatic Discharge (ESD), is defined as the transfer of electric charge, just like the spark of static electricity you get when walking across a carpet and touching someone's hand or a piece of metal. This discharge, while harmless to humans, can be damaging to delicate electrical circuit boards and sensitive components, which in turn, could cause severe injury to people working with the equipment. ESD-Safe magnifiers have special polymers applied to the lens, dissipative paints applied to the metal and the electrical layout is designed to minimize electrical discharge potential. They must also pass rigid ESD certification testing standards. 1. Use both eyes when using a magnifying lamp, just like you would use a comfortable pair of prescription glasses. 2. Make sure the lens is positioned to keep your object in focus, with your eyes are 8” to 10” away from the glass. This will give you the best magnification with the least amount of distortion. 3. For best results, keep your chair height and working surface positioned to maintain good posture. You shouldn't be leaning away from the lens when viewing the object.